There are certain things that will always be the holy grail of a particular food item in my mind. There was that amazing tangerine-flavored Snapple that I had in Ottawa, Canada that one time and have never been able to track down since. Or that transcendent pain au chocolat from the cute little boulangerie down the street from our airbnb in Paris. And I’m not the only who does this. I know because Shaun has been trying to remember where he ate a certain incredible sea bass dish on a work trip one time for years now. He keeps going back to restaurants and trying out their version, only to be disappointed. We both agree that the best granola either of us ever ate was at breakfast one morning on our honeymoon. It was crunchy and chewy, with just the right amount of fruit + a hint of cinnamon. My mouth is watering just thinking about it. In fact, if anyone from the Lucerne Inn in Bangor, Maine just so happens to read my blog and wants to shoot me the recipe, I won’t object one bit. Anyone? Anyone? Sigh. 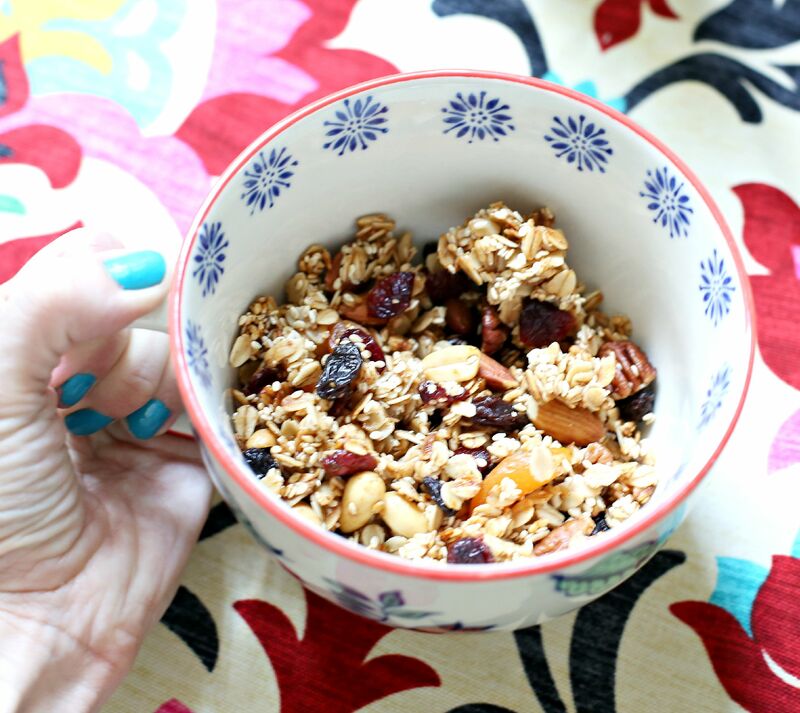 But, believe me, I’m not sighing too much because, while the honeymoon granola set the bar super high, the granola my mama makes is right up there with it. I always grab a handful (or three) when I’m at her house, and she has a batch lying around, but I’ve been meaning to make my own for an embarrassingly long time. I finally did because it’s compliant with our 14 Day Cleanse guidelines, and, oh man! Although my primary goal of the cleanse is not to lose weight, if I don’t watch out, I’m going to end up gaining some by the end of it because I am pretty much constantly grabbing a handful of this awesomeness to munch on as I make my way through the kitchen. It’s sooooo good. But low calorie? Not so much. Of course, with such a glowing recommendation, it wouldn’t be nice at all not to share, so I’m passing along my mama’s granola recipe so you too can feel healthy, all while over-indulging in something that should probably only be enjoyed in (yeah, right) quarter-cup portions (anybody remember the Seinfeld fat-free fro-yo episode? yeah, that). This “recipe” has a lot of wiggle room. And when I made it from my mom’s (admittedly) loose guidelines, I didn’t follow anything exactly or measure much. But it’s also kind of hard to mess up, so even if you’re an exact measurement type, and all of this “wiggle room” talk is making you nervous, I promise you’ll be okay. 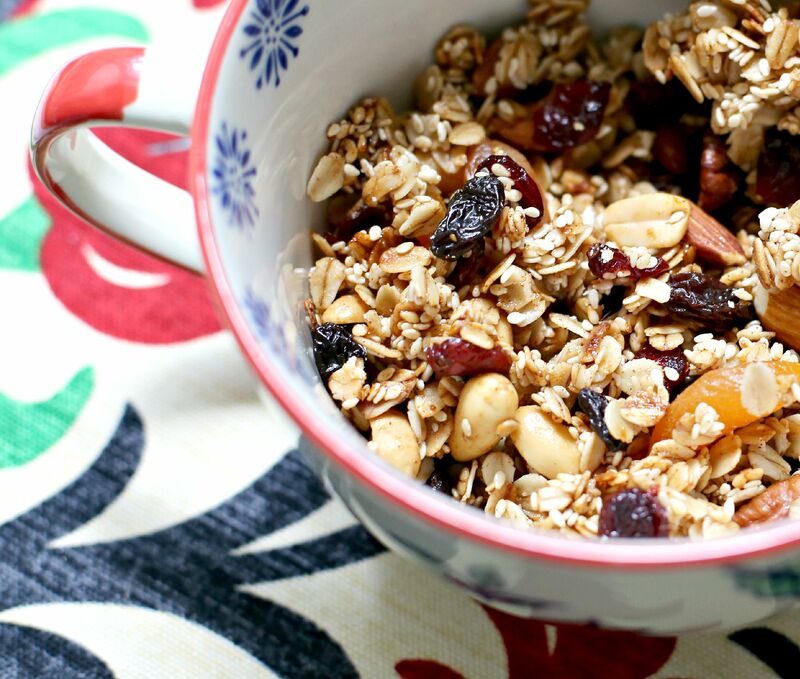 Here’s what you’ll need to make your very own scrumptious/addictive/hip-widening granola. 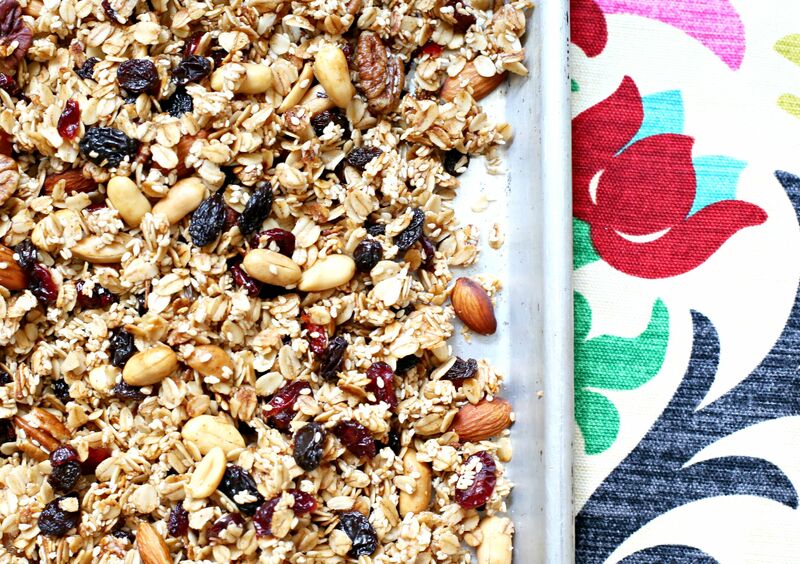 Mix together the oats, sesame seeds, and nuts until well-blended. Microwave coconut oil, honey, cinnamon, and vanilla for about 45 seconds – 1 minute, and then remove and stir well. 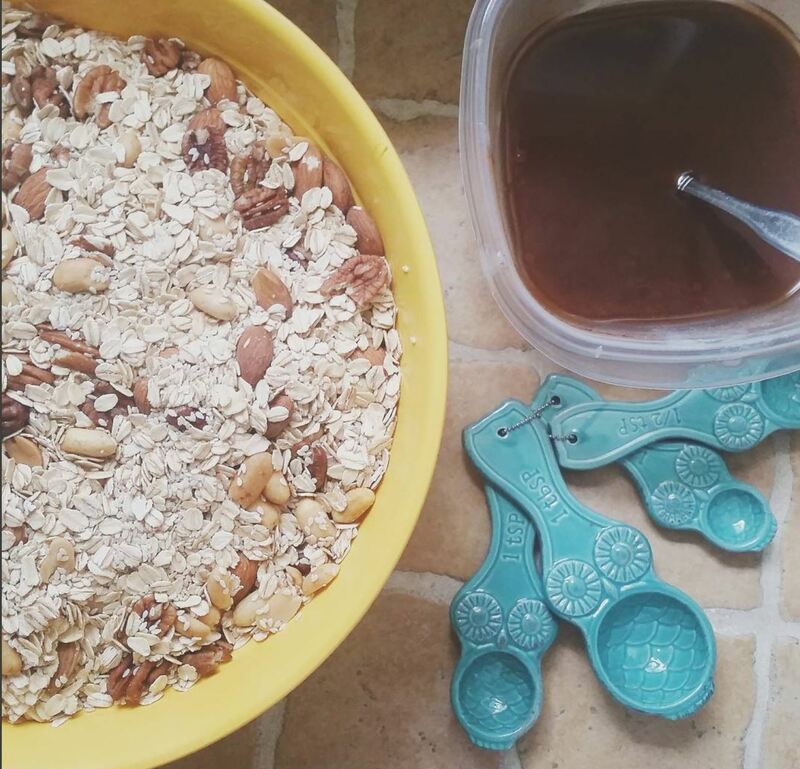 Pour oil/honey mixture over granola and mix well with a large spoon or clean hands. Spread onto a jelly roll pan or a deep casserole dish (probably both, since this is a lot of granola), and bake for 15 minutes. Stir well, then return to the oven for 15 more minutes. Add dried fruit, if using it, and return pans to oven for another 10-15 minutes. Stir again, and then let it dry on the pans, torturing you with its delicious scent. Store in gallon plastic bags and set it on your counter where you can snag a bite every time you walk through the kitchen. Or, if you don’t want to gain 10 pounds in one week, put it in a locked safe. Happy munching! And HAPPY Friday! Do you have tale of a dish that got away? Or do you know where I can buy tangerine Snapple? After my cleanse, of course. Ahem. Thanks for sharing this recipe. It looks delicious. I’m looking forward to making it and the chicken recipe you shared previously. I have a question. I’m sure it’s clear to most but I just want to clarify a couple of things for myself. 1. The coconut oil and honey are each 1 and 1/4 cups. 2. Is Quaker old fashioned oats okay. I’m assuming it’s not the quick cooking oats. Thank you. I just began today my Whole Food plan but I’ll admit the gallon of water a day just might do me in. Yes, old-fashioned oats are fine (not quick-cooking). I used fancy organic ones from the health food store, but next time, I probably won’t. And yes, 1 to 1 1/4 cup of honey and coconut oil. Keep chugging with the water (ha!). I think it gets easier as your body adjusts. Thank. I’ll buy steel cut oats next. 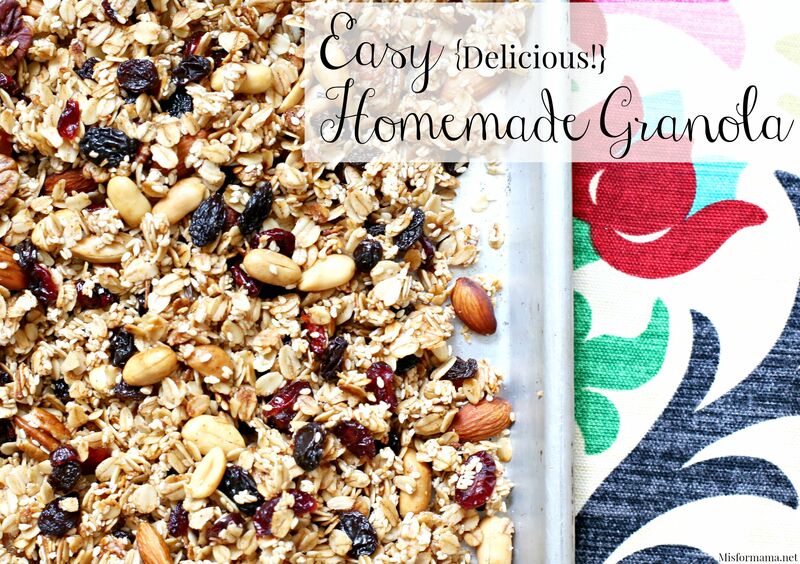 I’m looking forward to trying you granola (sparingly), your oven baked chicken, and turkey tacos. Again thanks for sharing. If you don’t add dried fruit, do you still bake it for that third round? It’s more or less up to you and how crispy you like it. I like mine crispier than not, so I would.